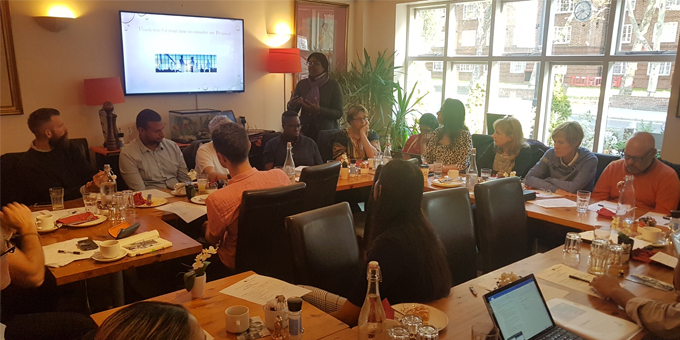 The Collaborative breakfast was held back at Abbevilles this month with some new faces and a busy agenda. Denis updated the group on the Living Well Network Alliance. 1) Living Well Centres – Comprise of 2 elements: the Front Door, which will be the first point of access and provide early support, and Focused Support, which will provide support for people with more complex, longer term needs. Proposing to have 3 Living Well Centres in the 3 Lambeth localities: North, South East, South West. 2) Crisis Support – Developing a range of offers for people in crisis as we know that too many people are reaching crisis point, often repeatedly, and a high proportion of people entering into beds are known to community services. 3) Acute – Looking to improve the acute inpatient offer in Lambeth, with some focused work around people staying for long periods on the wards and also looking to improve people’s experience on the wards. 4) IPSA Plus – Looking to apply the learning from IPSA to other placements across Lambeth. Denis suggested that there should be more detail on the service proposals soon and planning to share them at the next Collaborative breakfast. The Alliance are also continuing to engage around the service proposals and are doing some engagement jointly with the Local Care Networks, working with 2 organisations (IDEAS Alliance and WeCoProduce). An Alliance engagement group has also been set up to consider and plan how it should engage with people, especially community colleagues, users and carers. The next engagement event is on 18th October, following on from the July event at Morley College. There is a sense that the event in July didn’t adequately reflect our coproduction principles and so hoping to correct this in the October event. There is also a sense that we need to broaden out our engagement therefore the October event will be specifically for younger adults and not open to all. Agreed, however, that it would be useful for findings from the event to come back to the Collaborative for discussion and reflection. Following on from this, there was an interesting discussion about mental health in relation to children and younger adults, the range of available support and the differences to adults’ services. It was agreed that we should discuss this in the Collaborative in future, especially the issue of transitions between services. Carol Aka joined the Collaborative this month to discuss her proposals around a healthy lifestyle workshop. The workshop is a 7 week programme and includes a number of elements, such as healthy eating and lifestyle advice, trips to supermarkets, support to cook healthy meals, tips around exercise and keeping active and hearing from a wellbeing speaker. Carol is looking for funding from the Lambeth Wellbeing fund and a host organisation. She fielded questions about the referral sources and criteria for her programme and the ability of people to take up the advice around healthy living given other barriers, such as lack of money. Carol thanked the Collaborative for their time and asked people to get in contact if they were interested in hosting her project. Stef Abrar also joined the Collaborative to discuss a proposal around Time to Change Hubs (the overview document can be seen here). There is an opportunity to develop a Time to Change Hub in Lambeth, the main purpose of which would be to change behaviour and attitudes towards people with mental health problems, reduce the levels of reported mental health stigma and discrimination in the area and empower people with experience of mental health problems to be at the heart of all the activity. In order to do this, the Hubs are expected to focus on campaigning and social contact, typically running a number of events throughout the year, and embedding mental health anti-stigma work in local strategies and organisational policy. The Hubs will need a host (typically the Local Authority) and a coordinator (typically a voluntary sector organisation). The organisation acting as coordinator will receive a £15k contribution towards the staff time required to coordinate and support the partnership and £10k for a Champions Fund pot. The Collaborative discussed and endorsed the proposal, highlighting the importance of sharing stories and of people with lived experience of mental health issues leading an initiative like this. A number of organisations were suggested as potential coordinators and Stef agreed to follow up with these organisations with a view to putting in a bid. Stacey, Will and Ieuan presented an item on the Local Care Network developments in Lambeth (the presentation is attached here). Local Care Networks (LCN) have been working in 3 localities (the North, South East and South West) and comprised of the LCN Boards – which have delivered care coordination – and the LCN Forums – which have brought together a wide range of people and organisations across the areas to build relationships and networks. Now, the LCNs are engaging in new developments around Neighbourhood Based Care and Health and Wellbeing Networks. Neighbourhood Based Care is looking to bring together a number of community physical healthcare services and deliver them in 9-12 neighbourhoods across Lambeth, populations of between 30,000 and 50,000. The key services that will be based in neighbourhood areas are district nursing, general practice (working in clusters) and community/domiciliary care. Other borough wide service will need to be interface with these local teams. It was suggested that in order to support people best, the neighbourhood based services need to operate within a wider network of other services and community assets. Therefore, LCNs are also exploring the development of a Health and Wellbeing Network, which would include a wide range of things such as service offers, community initiatives, projects and groups and organisations. Key questions for the Collaborative were around how community physical health services in neighbourhoods would best interface with the community offer of the LWN Alliance and what, in practice, a Health and Wellbeing Network actually is and whether there is a possibility of creating one across Lambeth so as not to separate physical from mental health. The Collaborative agreed that there need to be an ongoing dialogue with the LCN developments and asked to be kept involved over the coming months, especially in relation to the developing Health and Wellbeing Network. Beverly updated on activity at the Sanctuary. There have been 180 visits this month from 37 members. 123 incidences of member support. Beverley also shared a moving testimonial from somebody who has used the Sanctuary recently about the impact it has had on them. Maggie and David updated on peer support activity. There are now monthly meetings and there is a plan to establish how many peer supporters there are in Lambeth and the range of activities they are doing. Sarah also updated that Healthwatch will be leading a session around peer support in the coming weeks. David raised the role of the Collaborative as a critical friend to the Alliance. He suggested that we need to return to this role and work out what it means in practice. For example, should the Collaborative send questions and reflections to the LWN Alliance Leadership Team for consideration? David agreed to talk to Caroline Hewitt – the LWN Alliance Chair – about the relationship going forward and feedback to the group.